Ariana Grande Supports Brother In NYC — Details Here!! 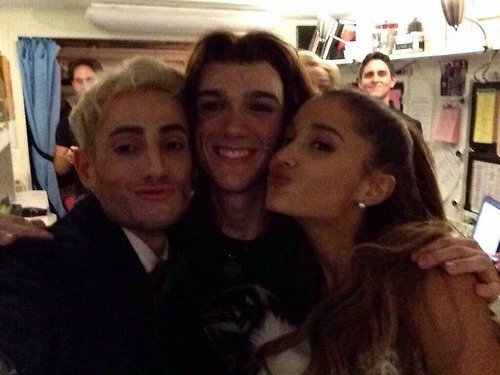 Ariana Grande was seen last night, Nov 15, as she took in a musical titled “Rock Of Ages” in New York City. She attended the show in support of her brother Frankie who is playing the role of Franz. In other Ariana news. Ariana has returned from her trip overseas and it is being said that she will be enjoying some downtime before she hits the road again for this year’s Jingle Ball Tour. Frank From Big Brother Reveals His Sister Is Ariana Grande — Watch It Here! Breaking news from the Big Brother house! Housemate Frank has been caught lying to his other housemates about his identity. It turns out the Frank is actually Frankie Grande! You guessed it, Ariana Grande’s brother!! Watch the dramatic reveal below! How do you think Ariana feels about her brother’s new found revelation? Help Frankie Grande Win Team America! Frankie Grande Rocks Out To Problem! Frankie Grande At Build On Ball! Frankie Grande attended the Build On ball last night! Check out the photo above of him and his mom on the red carpet! Ariana Grande Is White Hot For The White Party — See Pics + Video Of “Problem” Performance Now! After debuting her new single “Problem” — in Minnie Mouse ears, no less! — at the Radio Disney Music Awards in Los Angeles, CA last night (April 26), Ariana Grande made her way to Palm Springs, CA to perform at the 25 Year Anniversary of the White Party Palm Springs, the largest gay dance music festival in the world! Ariana went retro in a white fringed crop top and mini skirt with the white go-go boots she rocked at the White House Easter Egg Roll this past Monday. With a thick white headband and her hair pulled back into a swishing high pony, she put on an amazing show for a crowd at the Palm Springs Convention Center who was loving every second of it — including another performance of “Problem” featuring Iggy Azalea, which is available on iTunes at midnight tonight! Check out some pics of Ariana rocking it on stage at the White Party and don’t miss the video of her second ever performance of “Problem” afterward! Frankie Grande is headed to London! Frankie just announced that he will be apart of Digi Fest UK on May 4th, if you are in the London area be sure to go check out Frankie at Digi Fest! Be sure to check out the video below where Frankie announces he is going to be at Digi Fest UK. In the video he also shares his experience at Hogwarts! Frankie Grande On Way To White House! 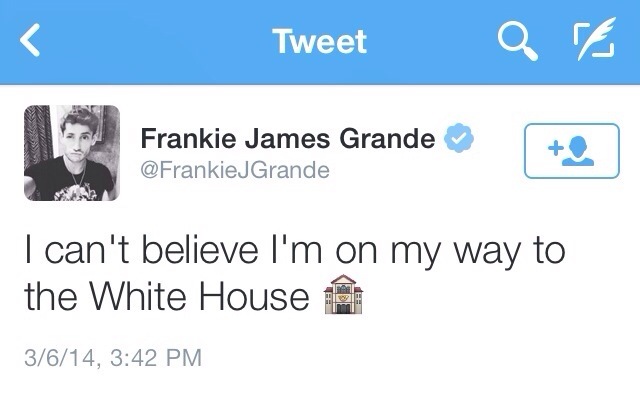 Frankie Grande has announced that he is on his way to the white house! He is super excited! Who else can’t wait to hear about it?